Garlic is known as a wonder drug and it’s been cultivated from ancient time. It was first cultivated in Egypt and garlic plant played an important role in Egyptians culture. Garlic contains many essential nutrients such as Manganese, Vitamin B6, Vitamin C, Tryptophan, Selenium, Calcium, Phosphorus, Vitamin B1 and Copper. Sulfur compounds can also be found in garlic which are very good for the overall health and especially cardiovascular health. Fresh garlic is excellent for the heart. Garlic is known for its anti-bacterial and anti-inflammatory properties. Sulfur compounds in garlic helps to protect blood cells from inflammatory and oxidative stress. Garlic is very helpful to lower the triglycerides and cholesterol levels. 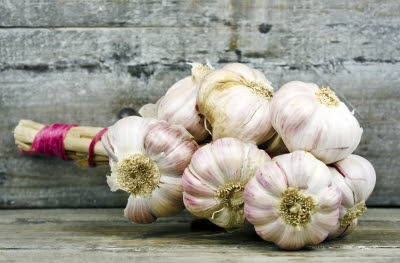 Also, garlic prevents blood vessels from becoming blocked and it prevents formation of clots inside the blood vessels. Or Garlic is good for controlling the blood pressure as well. Allicin in garlic helps to maintain a good blood pressure level. Vitamin C in garlic protects LDL cholesterol from oxidation as oxidized LDL cholesterol can damage blood vessel walls. By reducing the oxidization level it certainly helps to lower the cardiovascular disease. Garlic also contains Vitamin B6 which is responsible for lowering homocysteine levels. Homocysteine is Elevated concentrations in the blood are thought to increase the risk for heart disease by damaging the lining of blood vessels and enhancing blood clotting. Selenium and Vitamin E in garlic play an important role in our body's antioxidant system. Manganese also plays and important part as lack of manganese in the body decreases the levels of HDL (High-density lipoprotein). According to the researchers, a clove a day is enough to get the heart-healthy benefits. Fresh garlic restores good blood flow in the aorta. The researchers suggest that people who eat more garlic have got less chances of cardiovascular disease. Garlic is very good for the heart and it is wonderful for the overall health as well. It is not only a heart protective food but also has many other health benefits. Because of the health benefits of garlic it should be a part of our regular diet.